In the popular imagination, Afghanistan is often regarded as the site of intractable conflict, the American war against the Taliban a perpetually hopeless quagmire. But as Anand Gopal demonstrates in this stunning chronicle, top Taliban leaders were in fact ready to surrender within months of the U.S. invasion of Afghanistan, renouncing all political activity and submitting to the new government. Effectively, the Taliban ceased to exist - yet the American forces were not ready to accept such a turnaround. Driven by false intelligence from corrupt warlords and by a misguided conviction that Taliban members could never change sides, the U.S. instead continued to press the conflict, resurrecting the insurgency that persists to this day. Gopal's dramatic narrative, full of vivid personal detail, follows three Afghans through years of U.S. missteps: a Taliban commander, a U.S.-backed warlord, and a housewife trapped in the middle of the fighting. 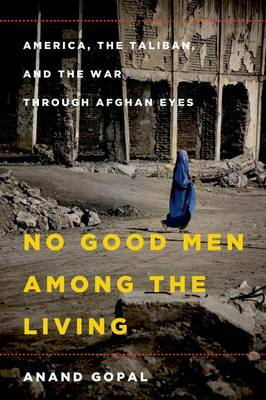 With its intimate accounts of life in small Afghan villages, and harrowing tales of crimes committed by Taliban leaders and American-supported provincial officials alike, No Good Men Among the Living lays bare the workings of America's longest war and the truth behind its prolonged agony. A thoroughly original expose of the conflict that is still being fought, it shows just how the American intervention went so desperately wrong.